The regions climate is semi-continental and, like the champagne region just 88 miles to the south, has cool nights which make it ideally suited for the growing of Chardonnay, Pinot Noir and Pinot Meunier for traditional method sparkling wines. The cooler climate enables the grapes to retain high levels of natural acidity when they are fully ripe which is crucial to producing sparkling wines with fine flavours. 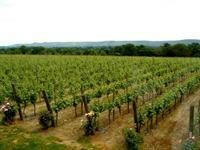 Some of the UK’s best vineyards are to be found within an hour’s drive of Tenterden. The largest UK wine brand growing their own grapes as well as using grapes grown in smaller local vineyards in its award winning sparkling wines - good enough to rival genuine champagne and please the most discerning wine drinker. A huge selection of red, white, rose & sparkling wines. One of the oldest commercial vineyards in Kent - grows and produces both wine and apple cider at its on-site winery. A small family owned and run vineyard and winery using traditional methods and minimum intervention to produce handmade wines. All wines are produced traditionally by hand and are suitable for vegetarians or vegans and contain no genetically modified products. Established in 1983, Battle Wine Estate prides itself on producing English wines of a consistently high quality. Only the very best grapes are sourced from the extensive vineyards. All the wines produced by Battle Wine Estate are Estate grown. The Estate’s wines are known as the ‘Saxon’ range of wines. In addition to these wines the Estate now produces a range of delicious fruit liqueurs and kir. Their aim is to make wine of the highest organic quality possible and to make wine that is a true expression of the grape varieties, soil and climate of the vineyards. They believe that the best way to achieve this is by interfering as little as possible and letting nature take its course. Ridgeview was founded in 1994 by Mike and Chris Roberts and is dedicated to creating world class sparkling wines in the South Downs of England. Their vineyards specialize in growing classic grape varieties to make the highest quality bottle fermented sparkling wines.